The San Jose was carrying gold, silver, gems and jewellery collected in the South American colonies to be shipped to Spain's king to help finance his war of succession against the British when it was sunk in June 1708. Colombian officials would not reveal the precise location of the wreck, but Mr Santos said the find "constitutes one of the greatest - if not the biggest, as some say - discoveries of submerged patrimony in the history of mankind". He said that a museum would be built in Cartagena to house the ship's treasures. 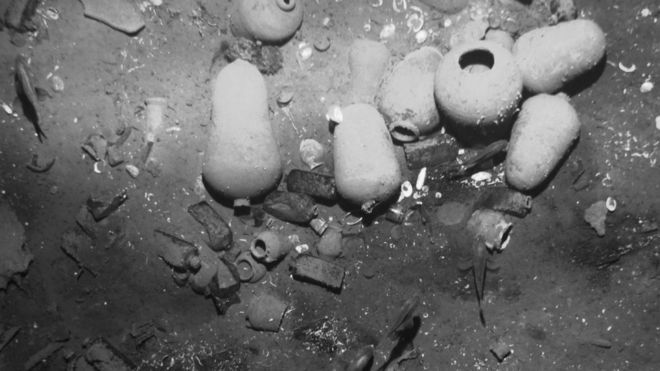 The Spanish government says it has rights to a sunken Spanish galleon discovered in Colombian waters. The foreign minister says he is asking for more information about the galleon, the San Jose, found after decades of searching. The galleon, which was sunk in 1708, belonged to Philip V of Spain. Its discovery was announced on Saturday. The ship was attacked by the British navy as it set sail for Spain laden, it is believed, with treasure. Spanish Foreign Minister Jose Garcia-Margallo said Spain wanted an amicable agreement with Colombia over the ship and its contents. But he said Spain would be prepared to defend its interests at the UN if necessary. The minister said that there was a UNESCO convention that stipulated that this type of wreck "belonged to the state, was the result of war, and was not a private boat". "This can be resolved in a friendly way," Mr Garcia-Margallo said. "They will understand our demands and that we are defending our interests just as we understand their demands and that they are defending their interests." In 2013 Colombia approved a law to define sunken ships found in its water as national heritage. Colombia estimates there are up to 1,200 such wrecks in its waters. It has been described as the holy grail of shipwrecks, as the vessel was said to be carrying one of the largest amounts of valuables ever to have been lost at sea - gold, silver, gems and jewellery collected in the South American colonies to finance the Spanish king's war effort.